Customer Feedback – Your Views are Important! It really is a different car now. The funny throttle response on idle completely gone and the fat torque and amazing power increase up the whole rev range is just great!!! But as fascinating as the power delivery is the sweet and smooth driveability and the whole characteristic and behaviour of the engine. All down to your knowledge, skills and perfectionism to please us Lotus freaks!!!! Still can’t believe the difference and it’s way over my expectations. Well done Greg, you made my day, my car and my favourite toy fun!!! Thank you so much indeed!!!! Just wanted to say a big thank you to you & Greg & your team! The smile on my face hasn’t stopped yet, the car is just how I wanted it to look & the drive is amazing, the roads here were fabulous. I’m so glad that I went with your Signature exhaust, the note is perfect and makes me realise how loud & intrusive the Janspeed was. The car was brilliant all day – really back in tune with the car, much better grip and improved feel from the steering, also the engine is zinging as well as it ever has! Thanks again. Just to let you know that I got the car out on track at Snetterton today and it was awesome, I’m so pleased, thank you both very much for all you have done. Thanks again for the season support. I don’t think I could have chosen a better environment to do a first race season. Thought I would drop you a quick line after collecting the car yesterday. Brakes are fantastic, thank you so much for the recommendation, your bell, rotor and pad combination gives me the confidence I was after. Exhaust sounds great. 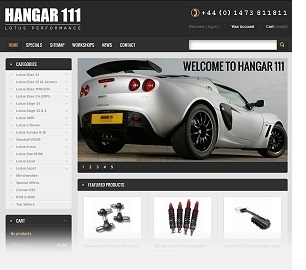 Again thanks to the Hangar 111 team, for the customer service and value for money. Subject : FAB H111 RACING! Thank you for awesome H111 support over the weekend, especially in getting the car back on track after my little incident! The car was great at Spa, the 430 conversion is superb and made the car sound and perform at a different level, there were 4 Exige V6 Cup’s there which did not stand a chance, and a Cup R which was also shown a clean pair of heels. Lots of car envy from these guys, you may well be getting some calls this week from a few of them. The parts arrived today. Thanks for the prompt service. Good drive home, I am very pleased. Massive thank you again, I really appreciate it. PS awesome workshop! Marianne and the rest of the Hangar 111 crew, I wanna say thanks for getting this done quick. I really appreciate the customer service and the quick email responses. You guys saved my car from being stuck here! Thank you again. Just a quick email to say thank you for your service in prepping and selling the Exige. As ever your help was fantastic, I have no hesitation in recommending you to anyone who needs the services you offer. Dealing with you over the past 3 years has been an absolute pleasure. I’m sure I will be driving the 220 miles for some work done, on the new vehicle in the not too distant future. I am really enjoying my 111R and the 280s upgrade you fitted in Jan 2013 is just a joy! I am already thinking ahead to my next visit and more upgrades! Just wanted to say thanks, as always – wonderful work. The gearbox is really slick now, amazing how much difference. Looks like new too with the re-spray. Very much appreciated. I managed to get some time yesterday to put 50 or 60 miles on the car. Absolutely delighted with it. Its even quicker than I could have imagined, quicker than anything else I’ve ever driven on the road. It certainly focuses the mind and demands some respect, especially given how cold its been. Even on part throttle it just lunges forward. Couldn’t stop grinning Can’t wait to give it the full beans once the oils changed and get a chance to put it on track. Not sure that it’s the sort of thing you’d want to be doing on the public road (very often) Wanted to say thank you for the considerable time and effort that has gone into it. Really really appreciate it. Just wanted to let you know that we received the box today, thanks for the quick and efficient service. It has been less than one week since our initial request and we have already received all parts; this is truly a testament to the amazing work the team at Hangar 111 are doing. We appreciate all of the extra items received and are looking forward to working with you again in the future. Enquiry Text : Just a note to say many thanks for the geometry check last week. Handling is transformed and feels perfect, a very noticeable improvement. Your advice on tyre pressure has taken a lot of the harshness out of the ride, which although still firm , now feels in better contact. It was great to drive before, now a whole lot better! Gob-smacked! I can’t quite comprehend how much of a transformation your conversion has made! It’s a completely different vehicle – phenomenal and much more than I’d anticipated but exactly what I’d hoped for. The induction noise alone is addictive! Brilliant work. Thank you both for the great service and a fantastic product. Hangar111 are simply the best in the business. We went to them with the challenge of preparing an Elise S to go to Bahrain in the Middle East, where temperatures are at least 40C in the shade for at least three months each year! Lotus said it couldn’t be done. The Hangar111 team spent a huge amount of time researching and developing a system to keep the car cool in the desert. “I love it when a plan comes together”; the car is currently being driven, with some “commitment” round the roads and streets of Bahrain, including the desert, at midday and the engine and oil temperatures are lower than the standard Elise S runs during the UK summer!! Hangar111 have developed an innovative cooling solution which meets the demands of the desert (including the sand!) with ease. Aside from the brilliance of the system, Hangar111 could not have been more helpful, they were on the end of the phone to answer questions at anytime, making suggestions, and giving their opinion on the options available to us. Marie-Anne is simply a gem! They did all the hard work, from planning to the implementation and whenever there was a snag, they came to us with the solution before we even knew there was a problem! We felt totally in the loop and they always delivered on their promises. There isn’t anyone else in the UK that I know who provides this level of technical brilliance, coupled with impeccable customer service and all at simply outstanding prices. All that is left to say is a HUGE thank you to the Hangar111 team, you have made a dream come true! Thank you very much. I received the badge and fitted it yesterday. It looks great. Thanks for your excellent service..I’ll use you again! Just a quick message of thanks really. The exhaust for my S2 Elise which I ordered yesterday has arrived as promised in less than 24hrs after the phonecall. Now that is what I call service! If only the rest of the automotive industry could operate to your standards! I shall not hestitate to use your services again when the need arises. Sorry I have been off work so haven’t opened my e-mail until today. Lizzie (my Elise) is driving FANTASTICALLY thank you for asking! Yep everything steers in the right direction and it does seem more stable in cornering quite quickly – probably down to not driving her for 7 odd weeks but thoroughly enjoyable. Thank the team for sorting it out! Thanks also for the excellent Taxi-service I took advantage of!